When you make the decision of who to entrust with the installation and finishing or refinishing of your hardwood floors in the Atlanta area, it is nice to have a third party certification that you are dealing with a professional company that you can trust with a major investment in your home. When dealing with hardwood floors one of the best ways to ensure that you are dealing with a quality company is to use one that is part of the Bona Certified Craftsman program. 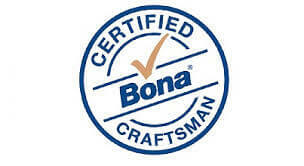 Peach Design, Inc. is proud to be a part of the Bona Certified Craftsman program. Members of this exclusive group are hand-picked, proven, top level professionals, trained and certified by Bona to use the complete Bona System when performing the initial finish or refinishing of your hardwood floors. Peach Design along with other members of this group are devoted to Bona product systems. We voluntarily undergo continued training with Bona so that we are constantly up to date on the hardwood flooring industry’s “best practices” and are rigorously tested by Bona to ensure the most beautiful and durable results possible for the initial finish or refinishing of your hardwood floors. Why is it important to choose a Bona Certified Craftsman When Refinishing your Hardwood Floors? What are the requirements to be a member of the Bona Certified Craftsman Program? Complete 30+ hours of hands on/class room training dedicated to best practices when sanding, refinishing, and caring for hardwood floors. Pass a 100+ question written test on technique and product application. Use Bona approved dust containment equipment during all sanding processes. Continue education with Bona through job-site visits and training several times a year. Carry enforced liability insurance coverage and workers compensation insurance required by law. Be an established business in the industry for a minimum of five years. In addition, each member is required to meet stringent criteria to sustain membership. When you are looking for a professional to install or refinish your hardwood floors in Atlanta the professionals at Peach Design have been trained and hold the certification to prove it, that you can expect the best possible results in the refinishing of your hardwood floors.